I was watching an episode of Jamie at Home the other day and was totally inspired to make my own ketchup as a way to use up a big bag of frozen cherry and yellow pear tomatoes I had from my garden. It’s getting to be the end of the season, for real, with real frost, and I’m down to the last dregs in the garden, so this seemed like a perfect way to use them up. I mean, a girl can only make so much salsa…or can she??? So as usual I didn’t really measure my ingredients, and I modified Jamie Oliver’s recipe quite substantially. Basically I cooked a medium-sized onion and a few cloves of garlic with some spices (about a tbsp of ground fennel seed, a tsp of ground coriander, 1/4 tsp of ground cloves, and the stems of a bunch of basil) in some olive oil for about 5 or 10 minutes, until everything was soft and fragrant. I added salt and pepper, and then dumped in my frozen tomatoes (a large Ziplock freezer bag full), a couple canned chipotle chilies with a few spoonfuls of the adobe sauce and about 1 1/2 cups of water. In hindsight, I would leave out most of the water next time since the tomatoes were frozen, it seemed like there wasn’t really a need to add more water – it just meant more time was needed to thicken the whole mixture by reducing it, and I got impatient. After things cooked down well (at a low boil for maybe 20 minutes) I added a big handful of chopped basil and then took my immersion blender to the mix to puree everything as well as possible. Then I strained it through a sieve to make everything smooth. The mixture was quite thin so I tried cooking it for about 45 minutes but was not satisfied with how slowly it was reducing down…I didn’t have all night after all! The answer was to add a can of tomato paste. This felt a bit like I was cheating but what the heck. It made it the right texture and punched up the flavour. Before it was all through I added about 2/3 cup of apple cider vinegar and about 4 tbsp of brown sugar for the sweetness of ketchup (the cherry tomatoes already gave it a lot of sweetness so if you give this a try do keep tasting it to see what you think). The whole thing was then packed into sterilized jars and processed for about 15 minutes. I ended up with 6 cups, after several hours of work. Will I do it again? It sure tastes worth it! Combine the onion, garlic, fennel, coriander, cloves and basil stems in a large saucepan with the olive oil, over medium heat, and cook until onion is soft, about 10 minutes. Add salt and pepper to taste. Add tomatoes, chilies, water and basil leaves and bring to a boil. Simmer until the sauce reduces to a thick consistency. Using an immersion blender, process the mixture (carefully – it’s hot) until its well pureed. Carefully strain through a sieve. You may wish to do this twice with two different gauges of sieve for a smooth, shiny texture. Return to the heat and add the tomato paste, apple cider vinegar and brown sugar. 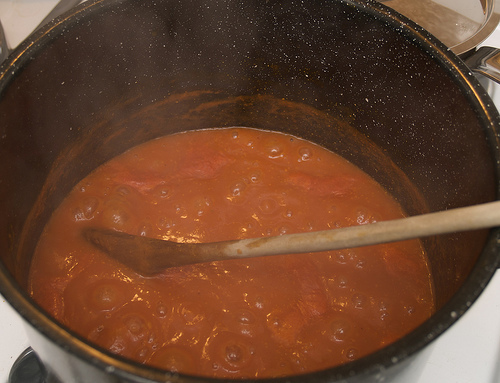 Simmer until the mixture is the consistency of tomato ketchup. Check seasoning and adjust as necessary. 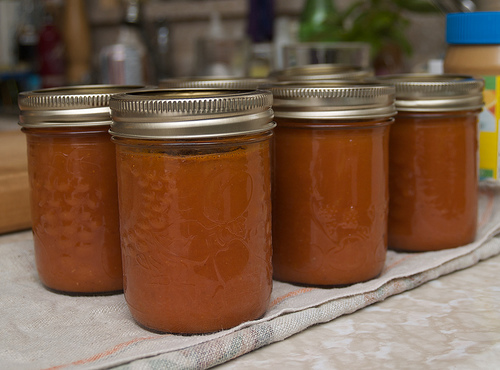 Can in hot, sterilized jars (click here for basic instructions). Process filled 250 ml jars in a boiling water canner for 15 minutes. Allow to cool. Any seals which haven’t ‘popped’ should be frozen or refrigerated and used quickly. Next Post Me = guest star on Ecoholic TV!